The Wolverines are guaranteed to be seeded no worse than fifth in the Big Ten tournament with the win. 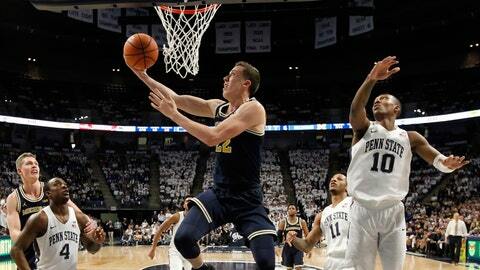 STATE COLLEGE, Pa. (AP) — John Beilein has always coveted the type of player with near-limitless energy reserve who can provide a scoring spark off the bench. Michigan’s coach has found his man this year. Duncan Robinson supported No. 17 Michigan’s starters with 19 points and helped the Wolverines beat Penn State 72-63 on Wednesday night. Moritz Wagner added 18 and Jordan Poole had 13 for the Wolverines (23-7, 12-5 Big Ten) who won their fourth straight. It got easier for the Wolverines just four minutes in when star Penn State forward Mike Watkins crumpled under Penn State’s basket with an apparent right leg injury. “That certainly was a factor in the game as well,” Beilein said. Tony Carr scored 21 points and Lamar Stevens added 19 for the Nittany Lions (19-11, 9-8) who trailed for all but about four minutes. Michigan took control with a 25-12 run midway through the first and Robinson made Michigan’s fifth of 10 3-pointers to put the Wolverines up by 13, their biggest lead of the game, with 3:52 left in the opening half. Back-to-back jumpers from Stevens cut Michigan’s halftime lead to 34-26. The Nittany Lions opened the second with a 13-4 run and took a 39-38 lead when Carr rolled a floater off his fingertips, drew a foul and made the free throw with 16:12 left. But the Wolverines went ahead for good on Muhammad-Ali Abdur-Rahkman’s 3-pointer with 10:19 left. Michigan players combined to go 9-for-10 from the free throw line in the final minute to close out the game. Watkins appeared to be in a good amount of discomfort as he was helped off the court. Afterward, the forward spent a few minutes on a courtside exercise bike before returning to the bench with 9:28 to play. He lobbied Chambers to let him re-enter the game, but was clearly hobbled before Chambers pulled him out for good moments later. Visibly upset, Watkins covered his face with a towel then entered the locker room before the half ended. Chambers said he didn’t have an update on Watkins other than the team would wait for test results on his right leg to come back later this week. It was the second straight game — and second straight loss — where Watkins’ presence was sorely missed. He found himself in early foul trouble against Purdue and played just nine minutes in Penn State’s 76-73 loss. The Wolverines entered the game having made 264 3-pointers, good for second in the conference. They dropped 10 more on the Nittany Lions including a pair of back-to-back shots from Wagner that broke up Penn State’s early second-half run. They were big considering Beilein felt like his squad was squandering most of its chances early in the second. Robinson was 3-for-6 and hit the final 3-pointer to give the Wolverines’ a 9-point lead with 1:28 left. Wagner was 4-for-5 from 3-point range while Poole added a pair. “When you give up 10 3s to Michigan, It’s going to be a tough outing for sure,” Chambers said. Michigan: The Wolverines are guaranteed to be seeded no worse than fifth in the Big Ten tournament with the win. They’ll have a chance to improve that as the teams above them in the standings No. 9 Purdue and Nebraska still have games remaining. Penn State: With a 3-point loss to Purdue in their last game, the Nittany Lions badly needed this one for their NCAA tournament resume. Watkins will be nearly impossible for Penn State to replace if it has to move on without him. The 6-foot-6 forward is third in the country shooting 69.2 percent from the field. He has 13 double-doubles on the season and leads the team with 68 blocks and 258 rebounds. The players who would likely replace his minutes –Julian Moore and Satchel Pierce — have averaged just 10 and eight minutes per game respectively. Michigan visits Maryland on Saturday. Penn State travels to Nebraska on Sunday.